Not only are these capsules made with name-brand kava kava, grown by a respected grower (Kona Kava Farm), they are also made in vegan capsules to please every type of consumer. We sell so many of these that not only is it difficult to keep them in stock, you can be assured that you are getting only the freshest product possible (important for strength preservation), since stock is constantly rotating. More importantly, though, be wary of most 30% capsules offered in stores and elsewhere on the internet: each capsule usually contains 200 mg of Kava Kava root, and only a few milligrams of 30% kavalactones extract. 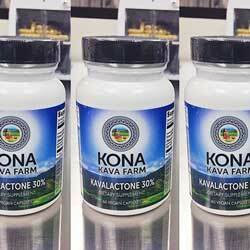 Our capsules are exactly what they say; there is 300 mg of PURE 30% kavalactones extract in each vegetarian capsule. You can read all about different Kava Products at Kona Kava Kava Farm's KAVA FAQ section on their site. Kava Kava is revered for its relaxing qualities*, and the kava we use is quite strong and suited to long and pleasant ceremonies conducive to sociability and the telling of long stories. Directions: 1 capsule 2 times per day. Daily dosage not to exceed 2 capsules per day. Maximum period of daily use: 3 months. Use may resume for 3 months after a 2-week break. *These statements have not been evaluated by the Food and Drug Administration. This product is not intended to cure, treat, diagnose, or prevent any disease. Contains NO soy or tree nuts.